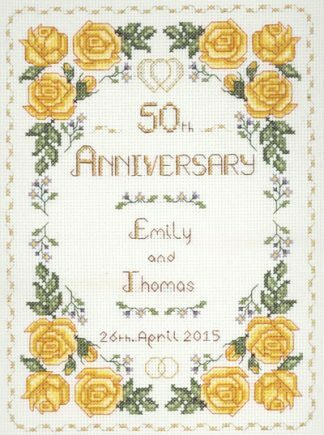 A Heart Golden Anniversary sampler with charm to celebrate a 50th Wedding Anniversary with a gold heart charm. The exquisite floral borders in subtle shades of deep gold are surrounded by a variegated thread for a subtle colour variation. 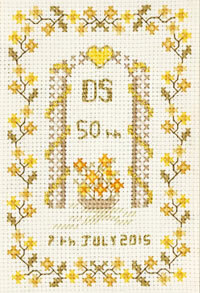 A Heart Golden Anniversary sampler with gold charm to celebrate a 50th Wedding Anniversary. A variegated thread gives subtle colour variation around exquisite floral borders are in subtle shades of deep gold. Silver and gold metallic threads bring the horseshoes and rings to life. This Heart Golden Anniversary sampler kit has only top quality materials ~ Zweigart fabric, DMC thread, variegated, silver and gold metallic and thread, charm and needle. 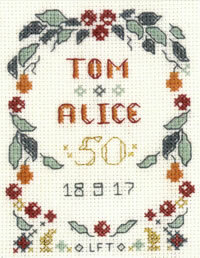 This Heart Golden Anniversary Sampler kit is from the Decorative Textiles collection.